U.S. manufacturers expanded for the 25nd consecutive month in September. Although the overall pace of growth slowed, production and hiring remained robust, according to purchasing managers surveyed for the Institute for Supply Management Manufacturing Index. Of 18 industries surveyed, 15 reported expansion. Respondents noted constraints from workers and supply chains, and they expressed concerns about tariffs. The ISM said that based on historical correlation, the index suggests a 5.1% annual rise in gross domestic product. The Commerce Department said construction spending grew at an annual rate of $1.32 trillion in August, the 20th month in a row above the 2006 peak. The pace was up 0.1% from July and 6.5% ahead of the year-ago pace. A rise in residential spending helped boost the construction industry year-to-year, and public spending outpaced private-sector construction expenditures. Growth in service-sector businesses accelerated in September, indicating expansion for the 104th month in a row, according to the ISM Non-Manufacturing Index. Some components in the index pushed or reached record highs. The trade group said that the monthly measure of the largest segment of the U.S. economy suggests that gross domestic product is expanding at a 4.6% annual rate. The annual sales pace of motor vehicle sales rose 4.5% in September, reaching 17.4 million cars and light trucks, the first gain since March, according to data from the Bureau of Economic Analysis. The sales rate was the briskest since November of last year but was down 4% from September 2017. Analysts said recent sales could have benefited from vehicle replacements in areas in the Southeast hit by Hurricane Florence. 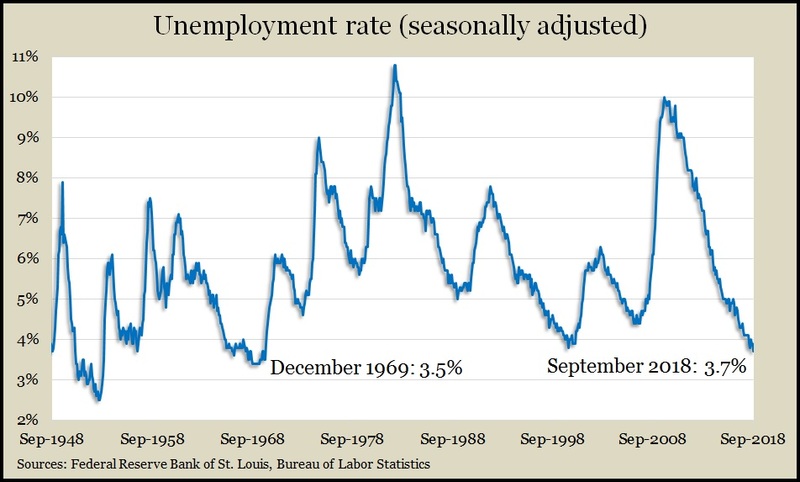 The moving four-week average for initial unemployment claims rose for the second week in a row after hitting the lowest level since December 1969. The measure of outgoing employees remained 42% below the 51-year average, which it has been below every week since early 2013, according to Labor Department data. The persistently low level of jobless claims is evidence that employers are reluctant to let workers loose. In another sign that manufacturing continues to advance, the Commerce Department reported that factory orders rose 2.3% in August, staying 8.6% above year-ago levels. Orders for aircraft led the increases. Excluding the volatile transportation category, orders increased 8% from August 2017. Orders for non-military capital goods excluding aircraft rose 7.3% from the same time last year, suggesting an ongoing lag in business investments. Employers added 134,000 jobs in September, making a record 96th consecutive month of payroll expansion, according to the Bureau of Labor Statistics. Revised estimates showed employers adding 87,000 more jobs in July and August than previously reported. Average wages, which analysts have been watching as a sign of nascent inflation, rose 2.8% from the year before – still a tepid rate, considering strong hiring conditions. 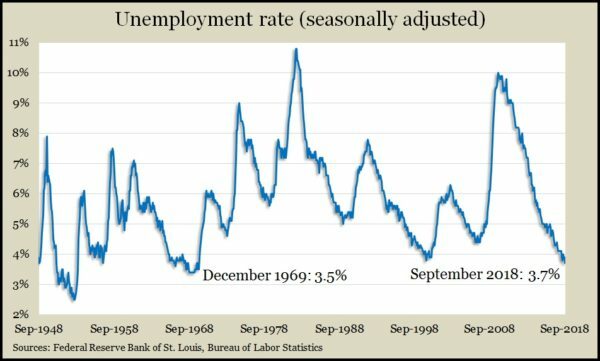 The bureau’s separate survey of households estimated unemployment at 3.7% of the labor force, the lowest since late 1969. The rate of eligible workers participating in the labor force – either working or looking for jobs – continued to hover at a low level not seen since for 40 years. The U.S. trade deficit widened 6.4% in August to $53.2 billion. According to the Bureau of Economic Analysis, the value of exports declined 0.8% following a 1% drop in July, led by farm products and industrial supplies. Imports rose 0.6%, led by vehicles and consumer goods. American consumers supported their spending with greater credit card debt in August, according to the Federal Reserve Board. Revolving consumer credit outstanding rose at an annual rate of 5.6% in August following a weak 1.6% gain in July and a decline of 0.8% in June. Consumer spending is the main driver of gross domestic product, and credit card use suggests individuals are willing to splurge today for what they’ll pay off tomorrow. Overall consumer credit rose at an annual rate of 6.2% in August. Non-revolving credit, chiefly student loans and car financing, rose 6.4%.